Most rug dyes are quite resistant to sun fading or bleaching. But let’s be real, sun means only one thing for carpets and rugs—sun fading. Ultraviolet rays are a powerful force of Nature. 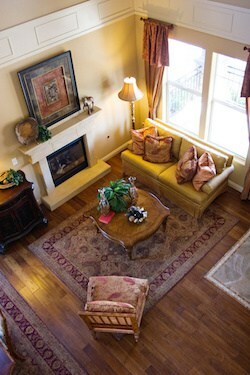 A rug will likely fade over time if used for years in a very sunny area. Consider placing your heirloom Oriental rug out of direct sunlight. Also, close the drapes while you are at work and try to turn the rug end-for-end once a year to even out possible color changes. An heirloom Oriental rug should be rotated once every year to even out wear and color change. Try not to use a rug on a very uneven floor. An area of the floor that is raised (a loose floorboard, a transition strip from one flooring material to another, etc.) causes the part of the rug that covers it to wear much more quickly than other areas of the rug. When you move a big rug to adjust its position, there is a better way than just to pull with brute force on the fringe or edge. A simple trick is to roll the rug up. Start by rolling from the short end of the rug so that the length of the roll is as short as possible. If storing the rug, make sure to have it professionally cleaned first before wrapping the rug for storage. If the rug is not cleaned prior to storage, it will be far more susceptible to moth infestation. Any particulate within in the pile will act like glass against the delicate wool fibers. If an heirloom Oriental rug has been folded for shipping, there may be wrinkles or creases when you lay it down. To flatten them out, first determine which way the nap lays (rub your hand across the pile in the direction of the fringe: the pile will feel smooth one way and will roughen up when rubbed in the opposite direction). Stand at the end of the rug with the nap running toward you. Roll the rug up, then slowly unroll and smooth it down along the way. Persistent wrinkles should be attended to by a professional rug repair and restoration expert. If not cared for properly, premature wear along the ridges made by the wrinkles can result in lasting damage. Some rugs have wrinkles “built in” as the rug is woven-try not to buy one of these! Not only with a rug pad extend the life of your rug, pads under a heirloom Oriental rug can prevent sliding, tripping on the edges, from creasing and provide comfort under foot. According to expert interior designers, rug pads can also help with sound reduction. A pad should be about an inch smaller than the rug all the way around (not counting the fringe) so that the pad will not show beneath the rug. Pads can be made of materials like rubber, felt, polyester, or one of a number of synthetic foams. We hope this article had some useful tips and tricks in helping to prevent wear and tear from damaging your treasured heirloom Oriental rug prematurely.